A pursuit in which an armed man carjacked a person, crashed into a pole and ran into a residential area ended when police took him into custody inside a North Dallas home Wednesday afternoon. Police say the chase began after recieving a call of a woman being held against her will at a motel. After the man jumped out of the window wearing body armor and carrying a gun, police chased the man on foot into a wooded area near the intersection of Abrams Road and Chimney Hill Lane in North Dallas. Texas Sky Ranger captured the man on video when he emerged from the woods, undetected by police, and carjacked a woman in the parking lot of Vineyards Apartments in the 9600 block of Forest Lane, firing a gun as he started to drive away. The woman was treated at the scene. Not long after the carjacking, he crashed the vehicle into a pole and started to run on foot. When the man exited the vehicle, he was visibly bleeding. 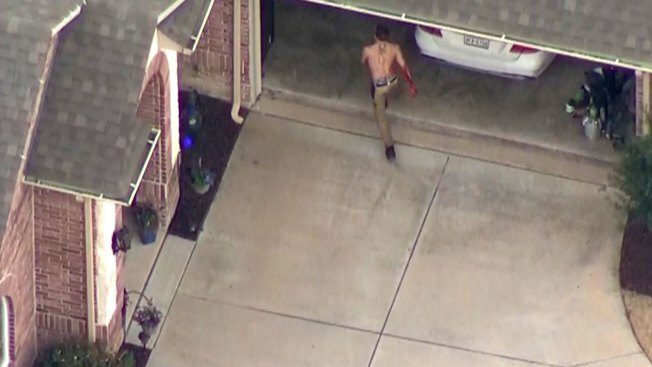 He then jumped a fence into a backyard, before finally walking into an open garage in the 12200 block of Jackson Creek Drive in Dallas. The homeowner was there at the time and grabbed a gun though police don't believe he fired. "He and his roommate were sitting on the couch watching TV when this gentleman came through the garage and into the house," said neighbor Sandra Gorham after talking with the homeowner. Police surrounded the house and ordered the suspect to drop a knife they say he was carrying. When he didn't comply, officers fired. The man was taken by ambulance with undisclosed injuries. For now, the suspect is only being described as a 26-year-old white male. During their final update Wednesday night, police said he was undergoing surgery. Police say they're still investigating how many shots were fired. They're asking anyone who may have captured any of the events on camera to call Detective Ramirez at 214-671-3668. RAW VIDEO: A pursuit in which an armed man carjacked a person, crashed into a pole and ran on foot into a residential area ended when police took him into custody inside a North Dallas home Wednesday afternoon.